Just a side note: The same approach works also for other messaging apps that support bot integration and activation via webhooks. Even better for Slack, that has its own channel on IFTTT, so no need to deal with webhooks. Nothing to say here, if you already have Telegram, you know how to create a group chat between the people you want to notify. Even if the conversation is between me and my wife only, I created a groups chat and not direct message because also the bot needs to be included. 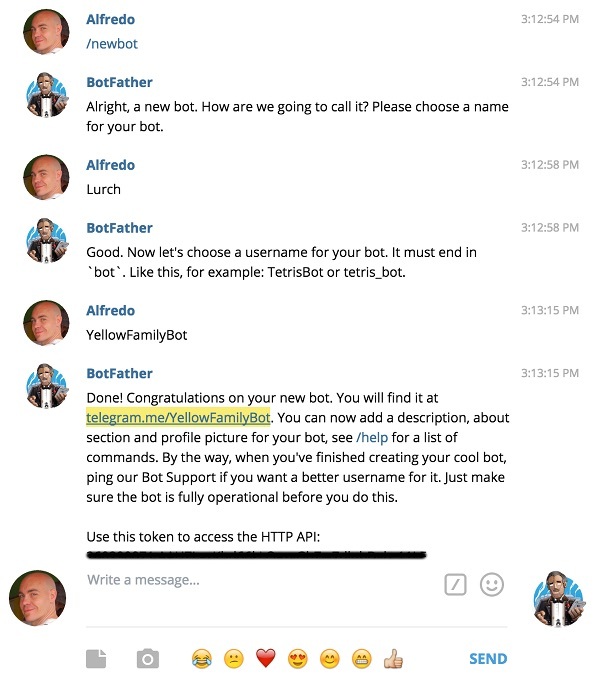 I followed the official documentation to create a Telegram bot, asking to BotFather for a new one, with name Lurch (oh yes, the name of my digital butler since my very first project of this kind during high school years), username YellowBot. As you can see, BotFather returned a token to use while calling the Bot API. I also set Lurch profile picture using /setuserpic command. I finally added the newly created YellowBot to the previously created group chat. 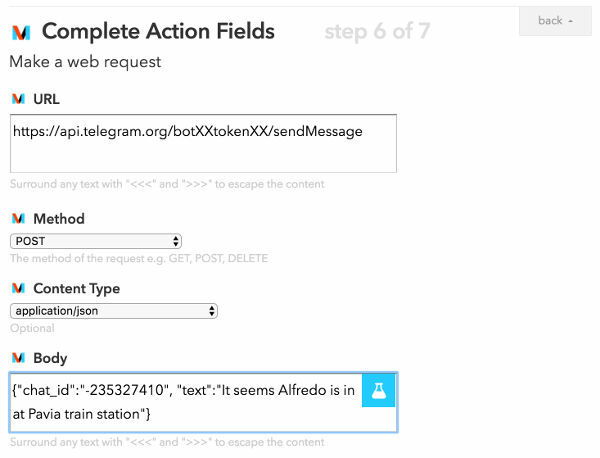 Telegram exposes a convenient webhook for posting a message thru a bot: the sendmessage API. It’s as simple as making an HTTP call, with some parameters in the payload. Two of them are required, the chat_id and the message. So, the group chat_id is -235327410. As per documentation, a negative id refers to group chat, positive to private chat with a user. The “Hello world!” message should also appear on the group chat, with the bot as sender. 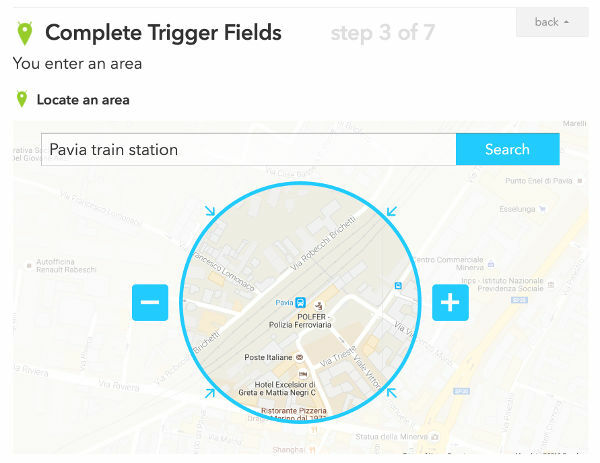 IFTTT has one channel to trigger an action when the device is in a specific location (in my case, entering the train station) for Android and for iOS, but hasn’t a dedicated channel for Telegram (yet). Luckily, the Maker channel comes in handy: what it does is to make an HTTP call to an URL specifying the kind of call (GET, POST, UPDATE etc), the content type and the message payload (if any). The exact information required to activate the Telegram bot just created. That’s all. Once I’m nearby the train station, the bot send a message in the group chat. Obviously, there are things to improve. For example, the recipe fires every time I’m around the location, even if I’m there for a walk. It would be great to activate the recipe only for a particular time interval, but IFTTT doesn’t offer this option. But the recipe could be manually disabled.